TL;DR – people were forced to abandon their shopping trolleys and had to leave the stores. In a perfect world, IT system updates should never cause pain for the users of those IT systems, but no matter how careful the testing and planning, I think it is reasonable to assert that we can never eliminate totally the chances of a major problem during an upgrade, our aim is always to shrink the probability to a close to zero as possible. That brings me to the point of this post – and this perhaps slightly controversial stance. I don’t think IT outages really matter that much from the perspective of the customer. For example, a while back Amazon had a huge outage here in Australia due to storms in Sydney. Delta Airlines had a big outage in late 2016. But last time I checked, people are still flying Delta and still buying stuff they didn’t need from Amazon . Customers will forgive an outage but only if you prioritize their needs over yours during the crisis. People are still ripping into Woolworths today because a Twitter apology doesn’t really get consumers any closer to taking groceries home. So this is what I would have done if I was Woolworths…. Make an announcement in each store that the store needs to close unexpectedly and customers to take your trolley to the nearest checkout (even though I know that the checkout’s are not working). At that point, simply let people take what they have accumulated so far in their trolleys for no charge. The news articles above already mentioned that the stores had security staff on hand to assist with closing the stores – so there is protection against a “looting mentality” being created. 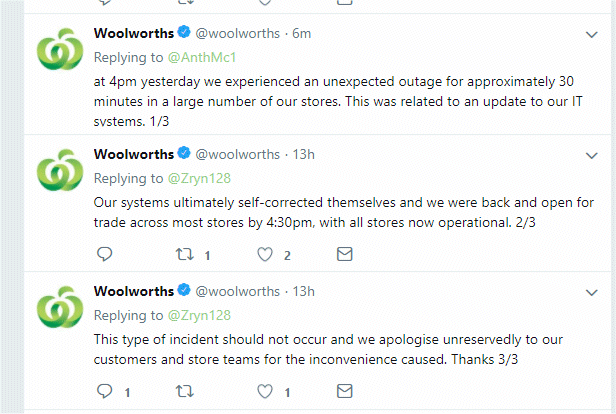 Yes, there will be still be some negative press for those customers that could not get into the stores once they closed, but I contend that ultimately this would have turned into a positive result for Woolworths. Yes you take a hit on the bottom line for yesterdays revenue, but the media attention becomes the mums and dads walking out of the stores smiling about the free shop they just got, rather than swearing they’ll never shop at Woolworths again. Outages don’t matter. Meeting the customer need is what matters. 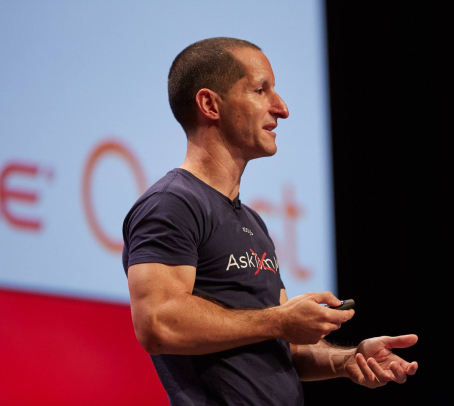 Don’t get me wrong – I’m not claiming that any and every company I have ever worked for, or worked with, has a glowing record of understanding how to meet customer needs during times of crisis. My point is that it should be something to always strive for – when you inflict pain on your customers due to the information technology solutions you build, then do your best to own the problem, and bust a gut trying to make the experience as bearable as possible for your customers, or even a win for them. Whether you turn bad into good, or bad into worse, rest assured your customers will remember you for it. I like the idea but how would it work out practically – all customers reporting to the checkout with staff making manual notes of items purchased? For me, that is still foisting the issue onto the customers. Recording what has been taken helps the *vendor* in terms of calculating revenue loss and perhaps stock inventory, but that is not the customers problem. So yes…its a painful exercise for the vendor….and that how it *should* be prioritised, ie, *vendor* takes the hit for the betterment of the customer. A local supermarket (part of a large chain) experienced a power outage, so no checkout registers were operational. They closed the doors, asked everyone to please come to the registers to be manually checked out. Once there…the customers were told that they would not be charged for the items and sent on their way with the items at no charge and a request to come back and shop again. The outage was not the fault of the store or their company in any way…but they took it upon themselves to forgo a bit of revenue to serve their customers. Smart management!